Cazneaux called this photograph his ‘most Australian picture’.1 It was done at a time when he was concentrating on capturing the Australian landscape, travelling extensively throughout New South Wales, Victoria and South Australia. He made three visits to the Flinders Ranges, where Hans Heysen had painted and Frederick A Joyner had photographed during the 1920s and 1930s. Heysen wrote of the difficulty in capturing the landscape, with its ‘clear space’ and ‘no thickness of atmosphere between you and the objects’.2 Cazneaux managed to achieve this by focusing on a single subject, often a weathered gum, which he would shoot from below, sharply delineating it from a tonal, receding landscape. In works like ‘Spirit of endurance’ and ‘Hollow gum’ he manages to capture the sense of light, heat and distance in the ranges. As his titles suggest, these images of trees still showing signs of life despite wound-like cracks, are meant to be read symbolically. The tree has been a recurrent symbol of human resilience. 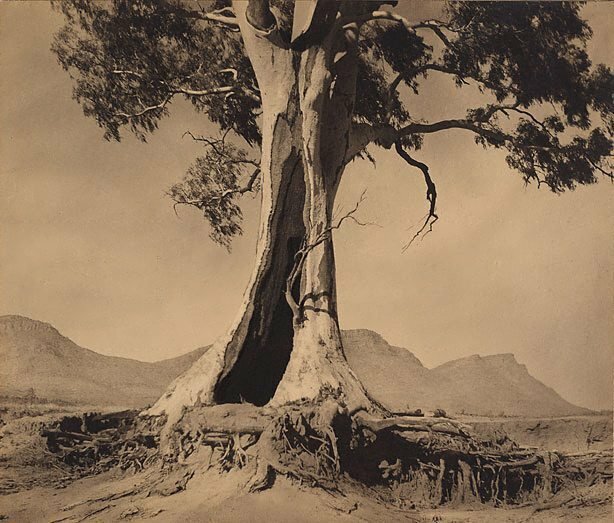 William Moore, author of the first dictionary of Australian art, described one in a photograph by John Eaton: ‘like an idealist who survives the buffetings of a callous world, the ti-tree preserves the witchery of its line in spite of the turbulence of intermittent storms.’3 Cazneaux flipped the negative he shot of this tree in the enlarger as he felt it best expressed what he was after in the final image. The tree still stands at Wilpena where it is now known as the Cazneaux tree. Signed l.r. card, pencil "H. Cazneaux" and u.c. verso card, pencil ".../ Harold Cazneaux... /...". Not dated.